Fresh Strawberry Breakfast Cobbler is delectable. I love strawberries for breakfast. 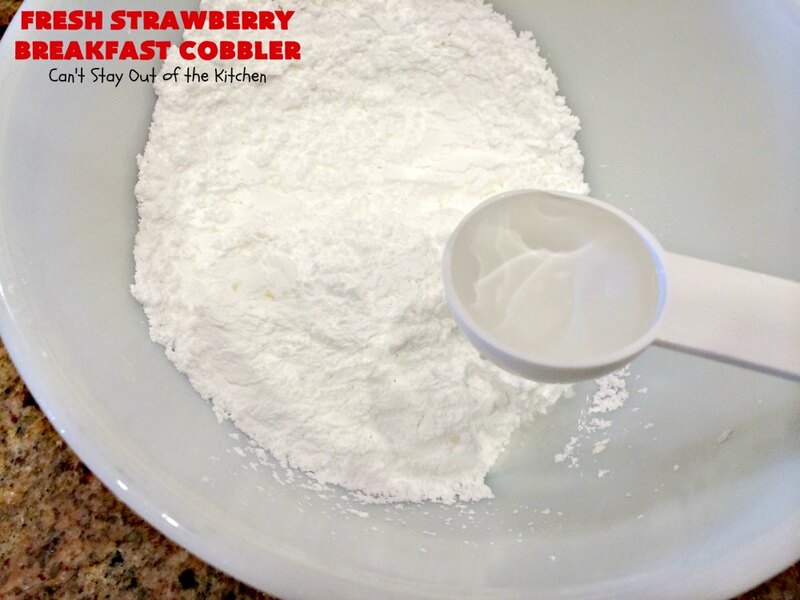 What better way to enjoy them then in one of my delicious Breakfast Cobbler recipes! 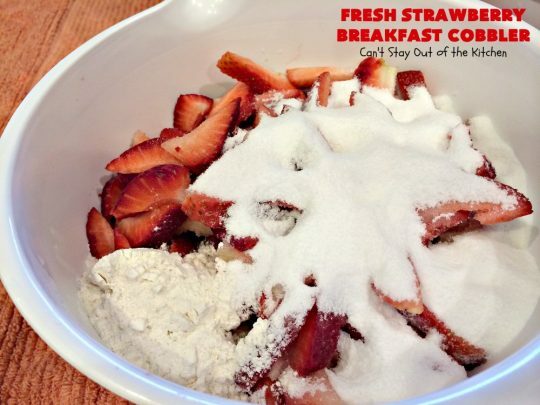 While using fresh strawberries is a little more work than just opening up a can of strawberry pie filling, this Breakfast Cobbler still turned out quite wonderfully. 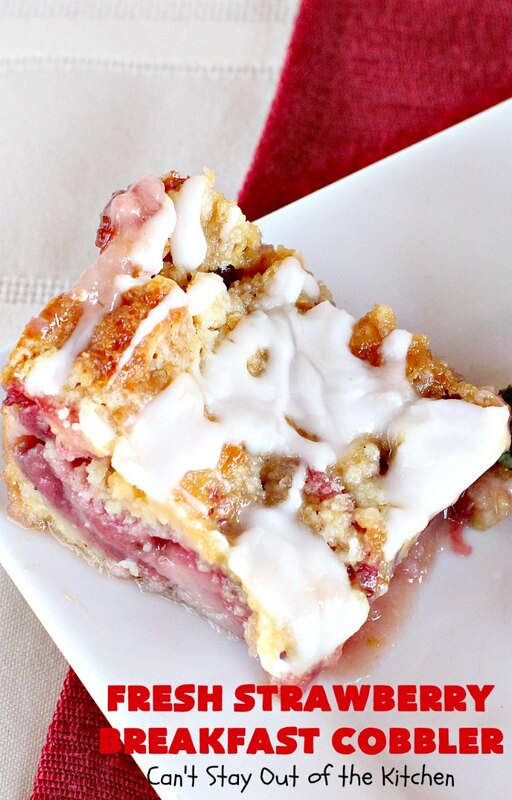 It was ooey and gooey like cobbler, with just enough crunch to be a little like a coffeecake. I couldn’t resist another delicious Breakfast Cobbler when I was making up all the goodies for our Ladies’ Retreat a couple of weeks ago. I had tons of huge fresh strawberries I needed to use up, so I used up 2 pounds making two more of these tasty cobblers. I had already made a Blueberry Breakfast Cobbler, a Peach Breakfast Cobbler and a couple of Pumpkin Breakfast Cobblers using up some of my backstock of canned pie fillings. 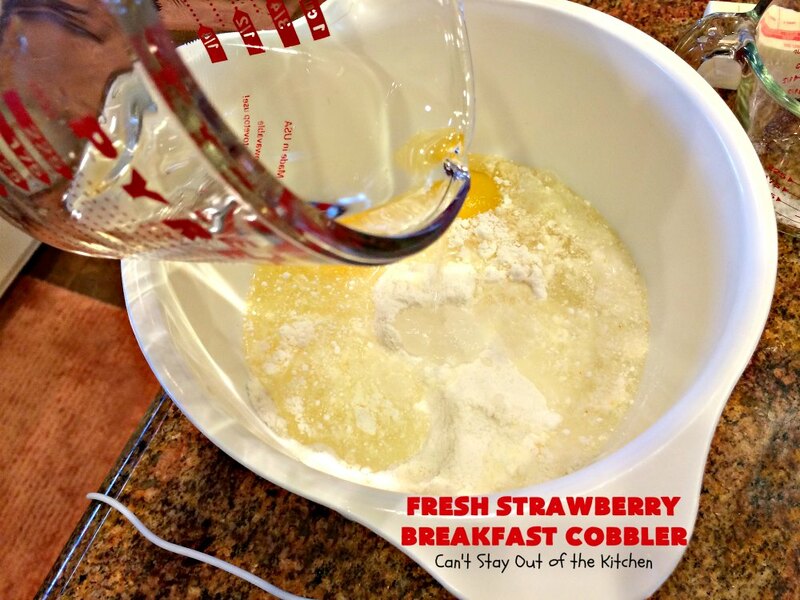 So, I thought I’d try a fresh Breakfast Cobbler and see how it would turn out. I was not disappointed. Fresh Strawberry Breakfast Cobbler just kind of dissolved in my mouth. It was spectacular. I’m going to make a couple of recommendations when using fresh rather than canned or frozen strawberries. First, remember strawberries ooze a lot while baking. Consequently, this cobbler recipe may take an hour or so to cook all the way through so that it’s not totally a sloppy, gooey mess inside. Second, I like a lot of fruit in my coffeecakes and cobblers, but you may not want your breakfast entrees so gooey. You can cut down the amount of fruit filling in half if you desire. 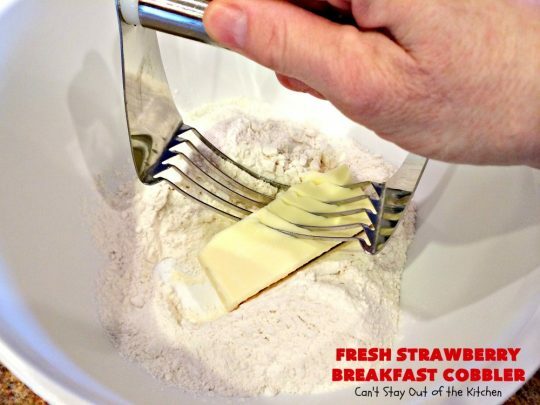 You would also probably want to cut back on the sugar and flour that the strawberries are mixed with if you do this. 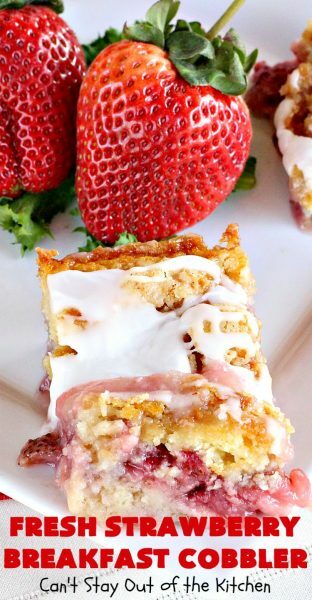 Third, substitute a can of strawberry pie filling and spoon it evenly over the surface of the cake batter if you prefer an easier method than using fresh berries. Just cook it long enough. You may even have to cover with foil to prevent the crust from getting too brown. 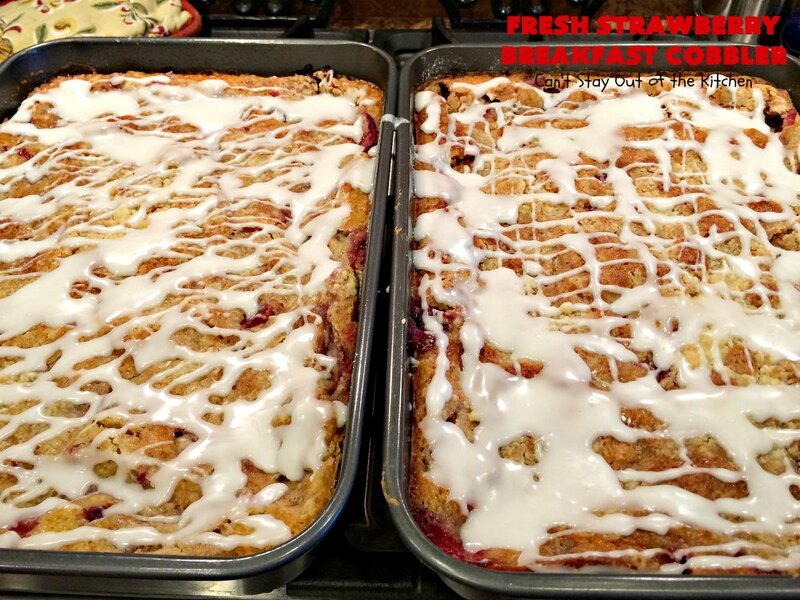 If you’re looking for a scrumptious strawberry breakfast entree that’s half way between coffeecake and cobbler, Fresh Strawberry Breakfast Cobbler is the recipe for you! It’s a great way to use up an abundance of strawberries too! 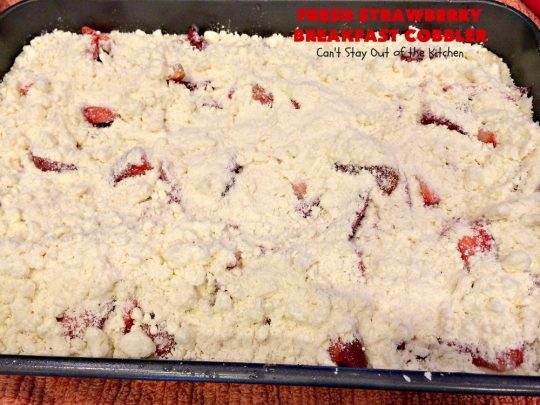 Fresh Strawberry Breakfast Cobbler is a great breakfast item for special occasions and holiday breakfasts, as well. 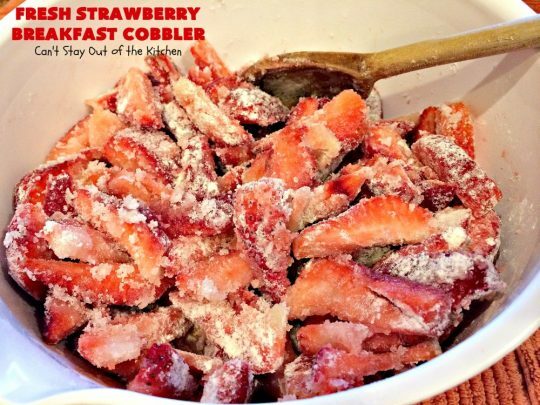 If you’re a strawberry lover, this breakfast entree will have you salivating! 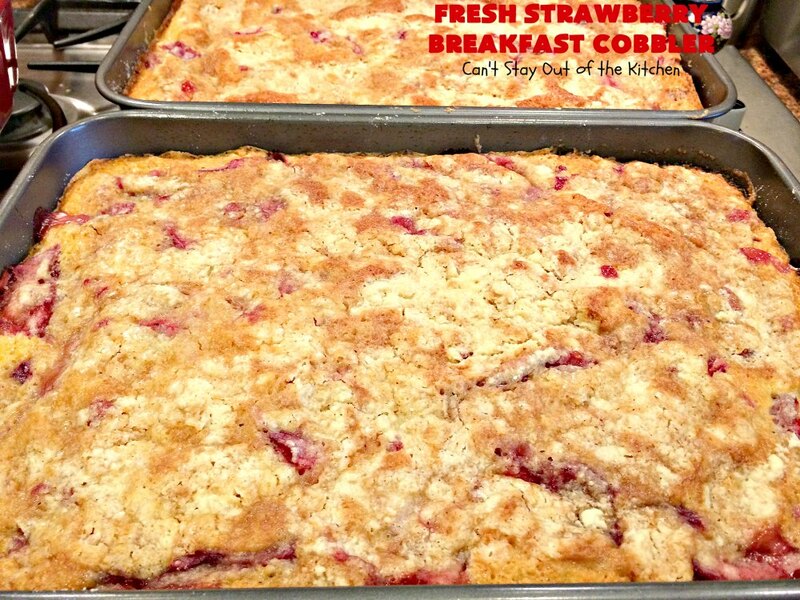 Fresh Strawberry Breakfast Cobbler is ooey, gooey and delicious! Fresh Strawberry Breakfast Cobbler melts in your mouth! Wash, hull and slice strawberries. Put in a large mixing bowl with flour and sugar. (I use UNBLEACHED all-purpose flour because bleached flour toughens baked goods). If you want your recipe to turn out more like a coffeecake and less like a cobbler than decrease these amounts to half. Mix 1 1/2 cups cake mix, an egg and water and stir to combine. Spread cake batter into a 9×13″ baking pan or dish that’s been sprayed with cooking spray. 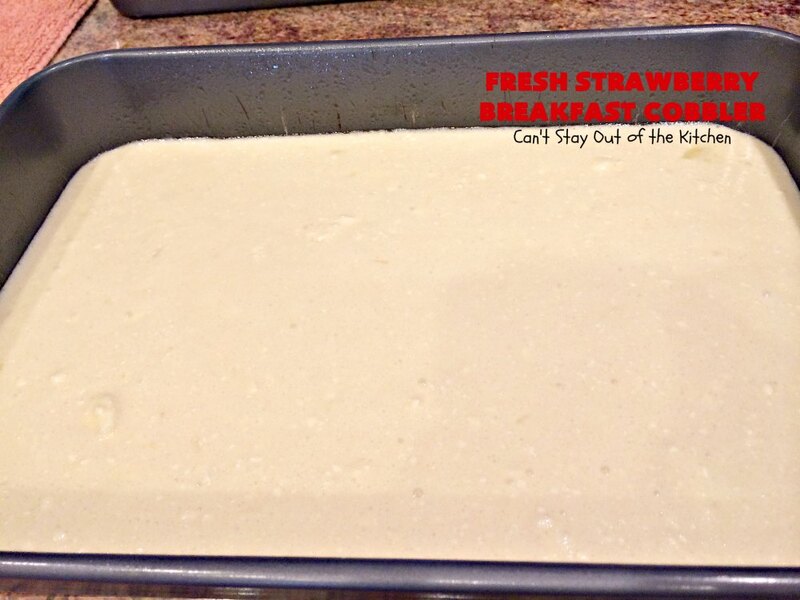 Spread strawberries over top of cake batter and distribute as evenly as possible. Mix remaining cake mix and butter with a pastry blender until mixture resembles coarse crumbs. 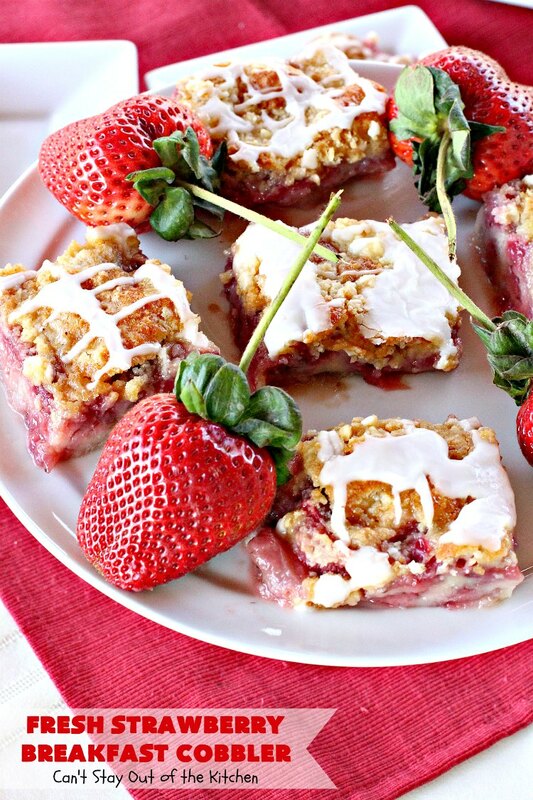 Sprinkle streusel topping over top of strawberries. Bake cobbler at 350 for 45 minutes to an hour or until crust is cooked through enough that the cobbler isn’t soggy. Allow cobbler to cool. Stir powdered sugar with milk or water. Use only enough liquid to make a really thick icing. A thin icing will dissolve into the cobbler and it will disappear! Drizzle powdered sugar icing over top of the cobbler. I cut the servings 4×5 or 20 pieces for each pan. 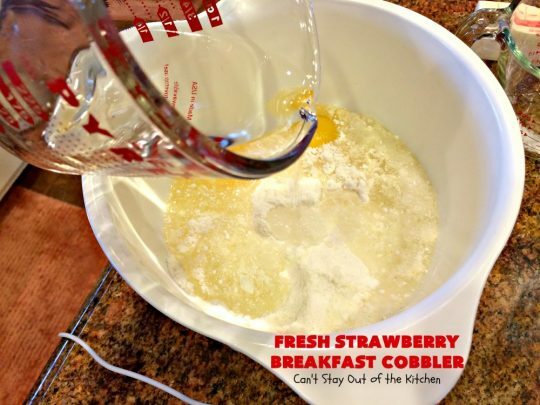 Fresh Strawberry Breakfast Cobbler is a wonderful entree for holiday breakfasts or special occasion breakfasts like Valentine’s Day, Mother’s Day, birthdays or anniversaries! Each mouthful of Fresh Strawberry Breakfast Cobbler is delectable. Scrumptious breakfast entree that's half way between cobbler and coffeecake. 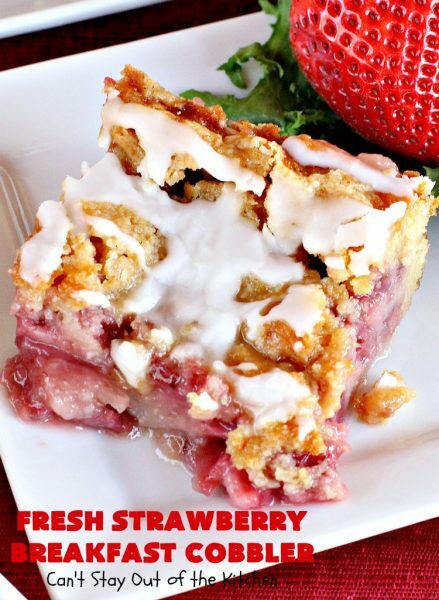 This one uses an abundance of fresh strawberries in the filling. Glaze with powdered sugar icing. Spray a 9x13” baking dish with cooking spray. Set aside. Add flour and sugar and stir to combine. Set aside. 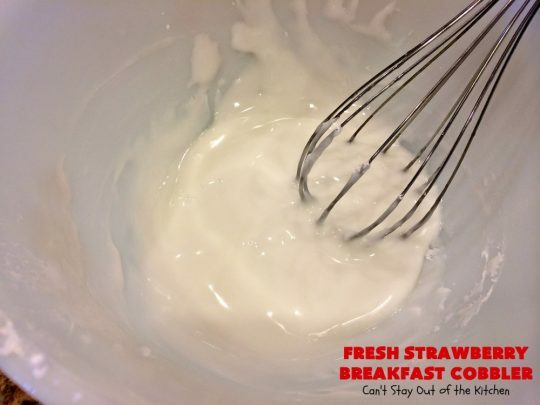 Stir 1 ½ cups cake mix into 2/3 cup milk and eggs. Spoon strawberry filling over top of batter in baking dish. Cut butter into remaining cake mix and sprinkle over filling. Bake at 350° for about 45-60 minutes or until toothpick inserted in center comes out clean. 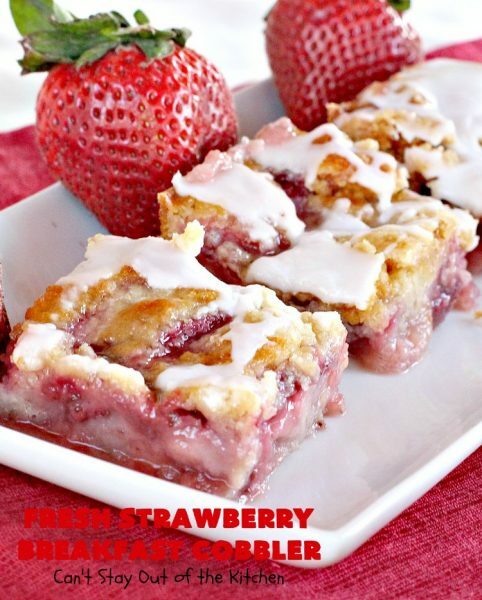 Drizzle with a mixture of 1 cup powdered sugar and 1-2 tbsp. water or milk. NOTE: Fresh strawberries ooze a lot more while cooking than strawberry pie filling. You will probably need to cook this close to an hour to get all the crust baked enough. NOTE: If you prefer less gooeyness in your recipe, reduce the strawberries, sugar and flour by half. The recipe will turn out more like a coffeecake and less like a cobbler. 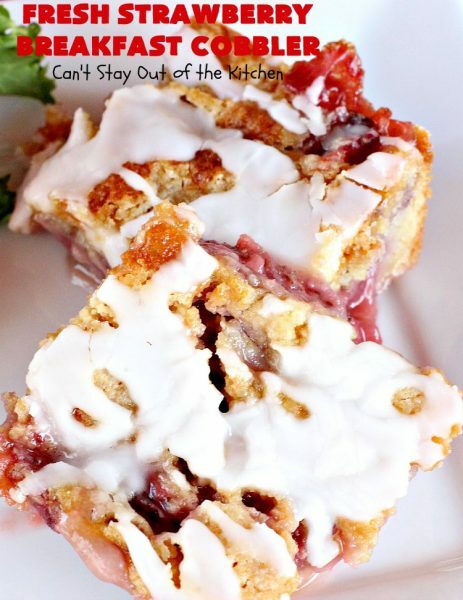 Scrumptious breakfast entree that’s half way between cobbler and coffeecake. 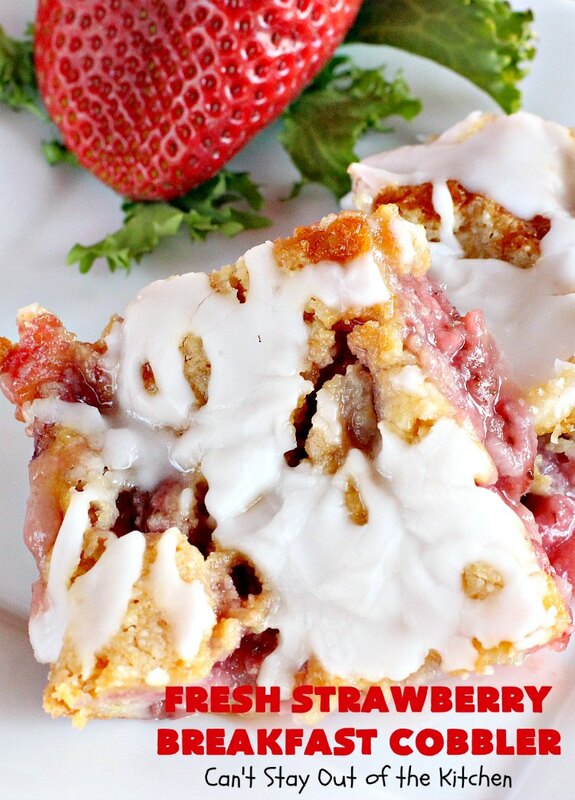 This one uses an abundance of fresh strawberries in the filling. Glaze with powdered sugar icing. Spray a 9×13” baking dish with cooking spray. Set aside. 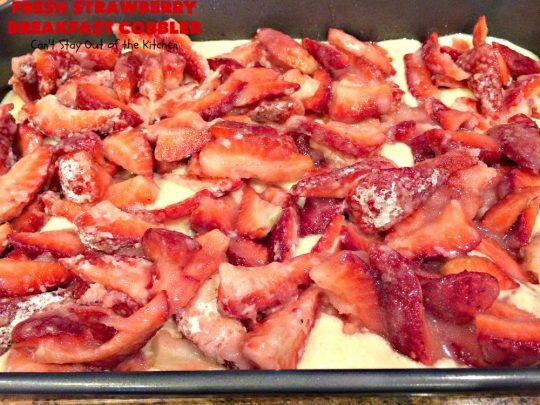 Fresh strawberries ooze a lot more while cooking than strawberry pie filling. You will probably need to cook this close to an hour to get all the crust baked enough. [br][br]If you prefer less gooeyness in your recipe, reduce the strawberries, sugar and flour by half. The recipe will turn out more like a coffeecake and less like a cobbler. Doesn’t Fresh Strawberry Breakfast Cobbler look amazing? Thanks! Can’t wait to try it! Do I need to warm it in the morning or just cover refrig overnight and good to go?? I wouldn’t warm it in the morning unless you are planning on re-applying the icing. Just serve it. You may want to set it out for a bit (if you don’t have time constraints) so it gets closer to room temperature to serve it. Can you make this the night before??? Looks so yummy! Yes, Ashley, I actually made it and froze it for a couple of weeks before serving it. My only recommendation if you’re using fresh berries is to make sure you cook it long enough or it will be too gooey. It may take an hour or so. And yes, it is wonderful. I can’t wait to try these, look delicious! Thanks. They really are delicious. Thanks for stopping by.